Place pork chops in 1-gallon resealable freezer plastic bag. In medium bowl, mix water, beer, brown sugar and kosher salt until brown sugar is dissolved. Add peppercorns, thyme sprigs and rosemary sprigs. Pour brine over pork chops. Seal bag; refrigerate 4 to 24 hours, turning bag occasionally. Heat oven to 375°F. Line cookie sheet with foil; spray foil with cooking spray. In large bowl, toss apples, garlic, parsley, chopped thyme, chopped rosemary, salt, pepper and flour. Spread apples in single layer on cookie sheet. Drizzle with 1/4 cup oil. Roast 45 minutes to 1 hour or until apples are softened. About 20 minutes before apples are done, remove pork chops from brine and discard brine. Do not rinse pork chops; pat dry with paper towels. In large skillet, heat 1 tablespoon oil over medium-high heat. Add pork chops; cook about 10 minutes, turning once, or until pork is no longer pink in center. Let stand 5 minutes. 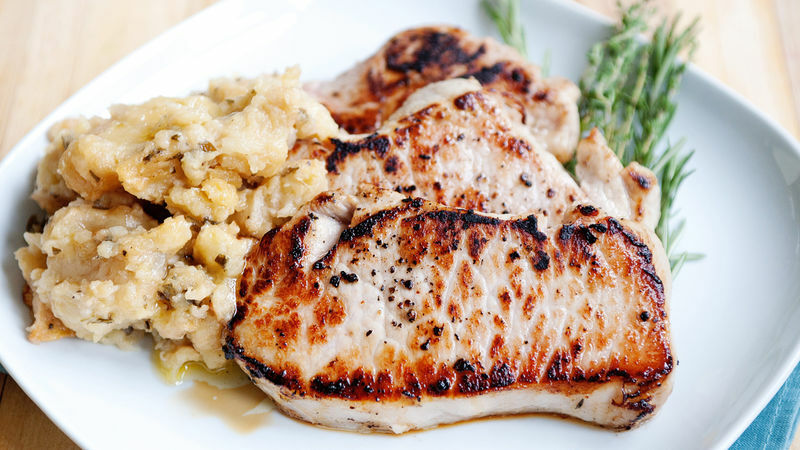 Serve pork chops with roasted apples. Garnish with additional thyme and rosemary sprigs, if desired. I like to use a honey wheat beer in the brine, but you can use your favorite brand. Use this same brine for a whole roasting chicken, and refrigerate for the full 24 hours. Once you start brining, you will want to brine everything! Try serving roasted apples instead of the same old mashed potatoes—your family and guests will be pleasantly surprised.